← Mahouka: oh how I wish they’d actually succeeded with this one! Do you really understand Taichi…? At the same time, I also don’t really regret focusing on characters like Chihaya, because I feel that she’s often neglected due to the heavy emphasis on the two boys. More importantly, however, I am also unlikely to be able to match the perceptiveness of some dedicated Taichi fans already in the fandom. Today, I wish to highlight an analysis from one of them, Selva, that was originally posted on tumblr. So, chapter 138, huh? I have to dig in even tho I usually just read the the posts in the Chihayafuru tag, smh at some of them and move along. This particular chapter, the infamous 138, is filling me with lots of emotions so I have to let them out somehow while addressing some few points while I’m at it. More under the cut. – Let’s start with the confession itself. It was so heartfelt, emotional and desperate. You can feel Taichi’s strong longing and love towards Chihaya, his desperation to reach her romantically, his frustration that she never saw him this way. What irks me in this part isn’t something Taichi said, it’s what Chihaya is feeling and thinking. I know the girl can’t help it but it’s still pretty sad to see. She’s not paying that much attention to Taichi who’s sitting there right in front of her and pouring his heart out, she’s thinking about Arata and his confession. This hurts… incredibly so. To Taichi and to me. – The rejection didn’t come as much of a surprise to me, or even to Taichi. He expected it, even tho he couldn’t stop himself from hoping that maybe there was a chance, no matter how small it might be. This also hurt. Because Chihaya flat-out rejected him (whether that ‘sorry’ meant ‘sorry, I can’t return your feelings’ or ‘sorry, I never noticed before’ is yet to be seen). What matters the most now is the implications Taichi received and they all screamed of ‘rejection’ to him. Now, here’s the other thing that irked me. You see, Taichi thinks Chihaya takes him for granted. I’m not going to be hard on the girl and say it’s true, but we all know Chihaya can be dense sometimes, so Karuta-centered and Arata-ceneterd it’s not even funny. This is a problem because sometimes she just doesn’t see/know she’s hurting the people around her. Now, imagine the pain Taichi must’ve felt when Chihaya flat-out rejected him with the ‘sorry’. Not even thinking about his own feelings and suffering, the things he had to deal with all this time because he loved her but never showed. The thing is, I don’t expect Chihaya to understand it right now. As I said, she’s dense when it comes to anything else not Karuta-related. This confession to her was so shocking and out of the blue and she never expected anything like this happening at all. I see where she’s coming from but that still doesn’t stop me from being irked, from being hurt, from being incredibly frustrated at how this thing all transpired. – Here comes the controversial part that I think a lot of people misunderstood about the chapter (or made their own judgments before reading the full raw). Taichi quitting the club. He didn’t quit the club because Chihaya rejected him. No. It was the last nail in the coffin so to speak but it wasn’t the sole reason or even the biggest reason there is for his quitting. Taichi has been feeling very depressed and down for the last couple of chapters. He can’t pretend any more that he’s not hurt. He’s always been pretending all his life that he doesn’t love Chihaya, that it doesn’t hurt him to lose to her or to Arata in matches, that it doesn’t hurt him how Chihaya seems to take his presence for granted, that it doesn’t hurt to have so much pressure and expectations from his mother and in the end it all fails. It’s just… too much and so incredibly hard to deal with, especially for someone like Taichi who’s been carrying this huge burden for most of his life. Taichi failed his agreement with his mom. His grades aren’t the best, and as a part of the agreement he had to leave the Karuta club before the new year begins. That’s why his friends in the club were worried. They all expected something bad was going to happen. His friends noticed, and not Chihaya. Again, another thing that irks me. You see, Chihaya has a tunnel vision when it comes to these things. I don’t think she even considered Taichi’s feelings after the confession or what he’s been going through… but I digress, I’ll speak about this in another point down the line. So, Taichi had to quit the club to focus on studies. Another thing we find out in the end is that all the cards seem black to him right now. 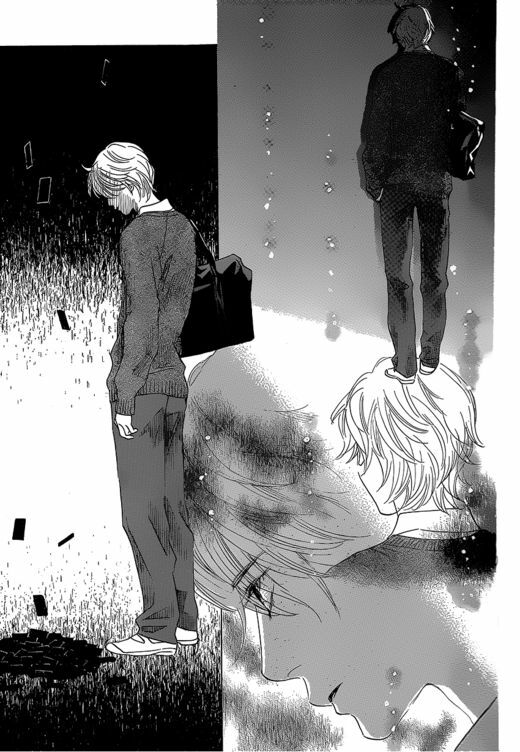 It’s pretty symbolic of how depressed he is, how lost he feels… whether it means he lost his reasons for playing Karuta or that it’s not fun any more to play Karuta, imo it symbolizes how incredibly hard and painful it is for him to play Karuta now. He just can’t. And it’s understandable and I sympathize with him completely. A lot of people who demonize Taichi refuse to understand his character or his motives. They just want to make him out to be the bad guy. I think his character is the most complex character in this manga. You need to understand where he’s coming from. People telling him to just get a grip and toughen up and move on don’t understand. He’s been doing just that for his entire life. He’s been pretending that it’s all fine and dandy -to his mom, to his friends and to Chihaya. And it’s hard. You can’t go on in life like that. Sometimes you just need to take a break. This is what happened to Taichi. I don’t understand people saying he shouldn’t have given up on Chihaya and the club or how selfish he is for doing that. Because you see, the world doesn’t revolve around Chihaya and her feelings and needs alone. Taichi is a human being and his feelings deserve to be respected as well. It is hard for him to play again. Not just because of the rejection but because of a plethora of other things. And I really can’t bring myself to blame Taichi here because we see, yet again, that he tried to let it go and to toughen up and to go on in life as if it was nothing. He tried yet again to do it. They spent days together after the confession playing Karuta in the club like they’re used to be. It’s not Taichi who’s acting weird. It’s Chihaya who’s being all awkward and distant. She doesn’t even look Taichi in the eyes any more. Again, I understand the girl, she just doesn’t understand these things and how to deal with them and this all came as a big fat shock to her, but you all have to take into account Taichi’s feelings in all of that. He didn’t run away right away. He tried to go on. He really did. But there are times when things just don’t work out the way you want them to be. I think he reached a point where he decided that he can’t do this any more, that there’s no reason for him to play any more and that he just can’t take it any more. – Now the most controversial part of the chapter. The infamous ‘kiss’, whether it was a proper kiss or not (I’d say it’s more of a peck on the lip) isn’t the point here. What matters is what it meant to both of them in the end. Some people take the kiss as it is and call Taichi a jerk for it, without trying to understand what led him down that path or why he did it. And this isn’t right. At all. You need to take in the full picture of what transpired between the two to get this part. I’m not going to condone a kiss that someone forces on another when the other obviously just doesn’t want it or doesn’t expect it. But you see, I get why Taichi did it. I understand where he’s coming from. And this breaks my heart even more. Here’s the last thing that irked me about this chapter, Chihaya’s actions in the last couple of pages when she finds out Taichi left. Now, before people jump down my throat, let me explain. As I said before, Chihaya is very self-centered sometimes and so Karuta-centered. She was confused with what happened between her and Taichi, feeling so awkward and weird (probably guilty?). The right course of action when you find out your best friend who just confessed his love to you (and you rejected him) quit your favorite club… is not to run after him on the street, crying and bawling and ordering him to not leave the club. Again, the world doesn’t revolve around Chihaya and her feelings only, other people have their own feelings too. Taichi does. Chihaya didn’t even ‘ask’ him why he decided to leave the club. She didn’t even ask him how he’s been doing the last couple of days after confessing (when all she did was keeping her distance away from him and not even looking him in the eyes). She, instead, demanded and pleaded he stays with the club. Chihaya just doesn’t understand the amount of struggle Taichi has been going through and she seems oblivious to his pain, anger and sadness on top of that and this breaks Taichi even more. Because it’s all about Karuta to Chihaya and his feelings be damned. That’s why he pointed it out to her, that he’s not ‘made of stone’, that he’s got feelings too, that he’s also just… tired of all of this. This is the lowest pit of despair that Taichi reached in this story. And as for the kiss, like I said I’m not going to condone it, call it romantic or romanticize it. Taichi was so full of desperation and anger that he wanted all those feelings to reach Chihaya (understandably). You can even tell that Taichi kind of regretted what he did the moment their lips touched so he backed away right after. But I’m not going to blow the kiss out of proportion too, calling it rapey and gross and yuck and OMG TAICHI YOU JERK! because no, it wasn’t like that. Well, that’s it. I just felt like letting it all out of my chest because the recent couple of chapters played with my emotions so badly. All I hope for Taichi now is to get better, to feel better, to feel genuine happiness even for once in his life. This is the second excellent post on Taichi that I’ve read over the last few weeks, the first being this discussion between a pair of Chihayafuru fans that ravenanne has saved on her blog. But the reason I’m reposting this one is that Selva explains very well why Taichi’s actions in this chapter make complete sense in the context of the character himself. She explains Taichi from his own point of view, not from the perspectives of the other characters, nor from the perspectives of the readers. Each time I read through it, I really feel the hurt and pain that she describes…and it brings me back to how I felt when I read through the chapter for the first time. That may be another reason I didn’t want to write about Taichi – my heart just breaks each and every time I revisit this chapter. So thank you, Selva, for writing this and for letting me share it. I can only hope that it helps more Chihayafuru fans understand how we – and a few others – are feeling about these recent developments. Karice, ofcourse this post of selva has been going round in the Taichi circles……….it broke my heart………I still don’t know where you stand when it comes to Taichi……..Suetsugu san is really playing with us. The second guy is sort of stealing the spotlight and the drama of this manga………Arata can’t match up to that in no way………..Taichi has put his stamp on this story for sure……….i don’t think there is no turning back anymore: i don’t see how Suetsugu san can have Arata catch up to any of the things that go on with Taichi. For me the male lead is Taichi and not Arata,(he is constantly present) but Taichi just steals the show……..thanks for your reviews and thoughts……..i really enjoy them! I’m not surprised – Selva explains Taichi’s pov very very well. I won’t go so far as to say that anyone who keeps trying to defend Chihaya by saying that everything is Taichi’s fault is heartless, but I really do wonder sometimes if we are all reading the same story! Hm…let me avoid anything that may stray down the shipping path here, but I’m not quite sure what you mean by where I stand when it comes to Taichi…? Hi Karice, I’d like to ask your side, do you think Taichi’s confession is planned or not? Hm…? What do you mean by “planned or not”? Do you mean just the content, as in the confession about him taking the glasses, what he says about why he likes Chihaya etc? Or do you mean the timing etc as well? Though I’m not sure he planned the exact timing, I feel like he did think about what he wanted to say to Chihaya. However, I’m not sure Taichi actually said everything he wanted to say – i.e. I’m not entirely sure he finished his confession, because he seemed to have realised that Chihaya wasn’t actually paying attention to him anymore. The first time I noticed this was in the Takamatsu Nomiya cup, Taichi and Arata sit to compete, and we are given the first couple of cards into the game, then all of a sudden the game is over. And it doesn’t matter…. I mean, we know Arata would have won anyway but was the game this unimportant to go through? Yes, i believe yes, because it was so much the more tragic this way; how we all know that Taichi is going to lose, and yet are still given the first couple of minutes, some hope in the comment of a spectator who notes how Taichi is stronger than he thought. The comment in the end becomes meaningless, it will always come down this way, Taichi, despite being the most hard working person, will always lose to talent, no matter what. Giving us hope and taking it swiftly by skipping forward was brilliant in my opinion. When you see him sitting on that train sleeping, with a tear in his eye, you realise just how unfair it all is, that you might as well “spend your entire youth” and not reach them (Arata and Chihaya) anyway. I think his contemplation on this line he got from Harada-sensei really speaks volumes. Especially in comparision to Harada himself whose hard-working ways paid off against Arata while Taichi’s didn’t. The state of falling into the pits that Taichi goes through is very understandable, and as Selva said, it wasn’t just about Chihaya but about being tired of everything. Taichi was always a self-loathing, self-deprecating person, as was continuously seen in his thoughts during Karuta matches, so he was bound to reach this state as a character. The manga’s atmosphere became bound by his, and no amount of valentine’s day humour could try to cheer it up. You have to fix things not cover it up with embellishments. In a way, the whole situation appeals to me, and Chihaya’s recent drop out of the club adds to this. It just feels realistic enough, and for a series that has always been on the boundary between realism and over-the-top representations for me, it’s really interesting. Thank you for dropping by and commenting, and my apologies for the late reply! Taichi’s always been something of a darker character because he was the only one who recognised the rivalry, not just between himself and Arata, but also between himself and Chihaya. The other two always thought that karuta was an ‘extra’ for him that he wasn’t seriously pursuing, and that created something of an unbalanced relationship. This ‘dark’ part of the manga, I feel, is needed in order to fix that — it’s crucial, in fact, for the manga — which might be one of the reasons that Suetsugu herself seems to have had a few ‘writer’s block’ type periods ever since she started writing it. That said, I’m hesitant to say that Taichi and Arata’s match at the Takamatsu no Miya Cup is as depressing as you all make it out to be. That is, after all, the first time that Arata realises that Taichi is a rival. He’s indicated it several times before to Kuriyama-sensei/Murao-san, but there’s always been a sense that it’s more about Chihaya. The fact that Arata looked around for Chihaya when he spotted Taichi also supports that. But now, after their first formal match, Arata really is looking at Taichi as a rival too. I think that this should make Taichi happy, but I don’t think he has realised it yet: he might only really feel it the next time they meet, and I think it would be good if he does manage to defeat Arata then. But the other reason I don’t find that match that depressing is because I feel that it challenged Taichi to think about what he was doing in the karuta club and with karuta in general. The part where Tsuboguchi asked him about Arata: it felt like Taichi himself realised that one of his problems was that he was hesitant about throwing himself into karuta — in other words, he realised that unlike Harada, he still had not dedicated himself to the game. He has reasons for not being able to do that (in contrast to Arata and Chihaya, who are effectively building their lives around karuta), but that nevertheless still means that he was still not the hardest worker at karuta because he had to divide his time between the game and studying to become a doctor. So I think that Taichi’s depression in these few chapters is largely because he feels lost, he’s unsure about how much he should be devoting himself to karuta, possibly because he doesn’t know what such a future will bring. Chihaya not noticing and appreciating what he is to her is just one part of this. In fact, if she did actually show how much she appreciated him, I doubt Taichi would have progressed further in karuta, because I feel that he would have been somewhat satisfied with that. So in a way, perhaps it was actually really important for Taichi’s development (into ‘someone who doesn’t run away’) that Chihaya was so oblivious to his feelings for her. Hm…my apologies…I think that this has gone off in a different direction from what you were driving at! These two chapters had so much depth in them. Excellent review by Selva. Reading it reminded me of all the feelings I felt when I first read the chapter. The hurt, confusion, desperation were all expressed in her post.